Comments: 7/94 Not available as a stud dog. 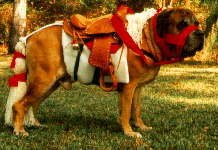 Marshal is an unusually athletic mastiff. He can easily jump a 4 foot fence, even at his current age of 6 1/2. He was x-rayed for elbow dysplasia at 5 years old, and has the mildest form of DJD (arthritis) in his left elbow. His right elbow is normal. His two litter sisters, Gold Coasts Emelia OFEL MF-EL42-T, and Gold Coasts Polaris Carri-On CD OFEL MF-EL44, are both clear. Marshal has no health problems; has been CERF normal since 1989; re-CERFed every year. He has 1 leg on his CD title and will be back in the obedience ring this fall. He is over angulated in the rear like his grandsire "Rambo", Gulph Mills Resounder. He has a lovely temperament, and is non dog aggressive. His best features are his excellent front, feet, topline, and head. 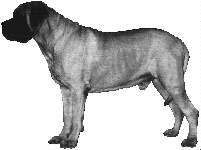 He is well wrinkled and has a broad skull and short, blunt muzzle. He moves well, with power.